Yip this week the big ol' Green Lantern movie trailer debuts smacked on the front of Harry Potter and the Deathly Hallows: Part 1. But if you have one two many ants in yer' pants and can't wait for November 19th to roll around, Entertainment Tonight has this 30 second teaser of the trailer, packed full of GL goodies like Oa, Carol, a suited up Hal Jordan (does Ryan Reynolds get to stay clothed in any movie? ), and yip the universes ultimate drill sergeant -Kilowog. What you still haven't clicked play yet? ya know ya just can't tell if a movie is going to be any good based on the previews but i'm still looking forward to seeing it anyways. Why oh why did they pick Ryan Reynolds for this. Darnit not that hes not decent enough eye candy, but his acting his pure garbage. And has been ever since "You cant do that on television." And that other stupid canadian teen show he was on. What a way to break my heart I followed very few DC and this was one and they go and ruin it for me. The trailer hints the film is going to be a little lighter than I thought it was going to be too Darzia, but I'm thinking the scales will be evened and the show stolen by Mark Strong as Sinestro - mark my words. 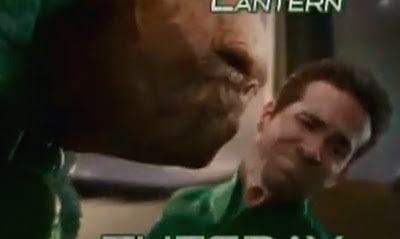 Mind you I'm like you David - I'd look forward to seeing Green Lantern the movie even if it was cast with chickens. I mean it's the concept of Green Lantern - It's made for Hollywood! Yes, Ryan Reynolds is generally known for being that funny guy "Waiting" or "Van Wilder" (which, by the way, are both comical genius, I don't care what you think of me from now on), but did any of you see the remake of the Amityville Horror movie? He was pretty convincing as a wacked out killer. So he actually can act. And the movie "Definitely, Maybe" was more drama than comedy and it wasn't half bad, although I know you guys probably didn't line up for it, since it was pretty much chick flick fair. But I wouldn't write off this movie based on Ryan Reynolds' acting. Let's wait and see how they screw up the script first. Hey RN - I'm glad you brought that up. Ryan was hell scary in that film! Easily one of the better remakes of the last few years thanks to him. I can't say I've seen "Definitely, Maybe", but I also like how he went down in "Smokin' Aces" too - and apparently he's brilliant in "Buried" so he could sure add another to the list with this film.